Warner Bros.’ The Big Picture 2001 presentation at CinemaCon ended with new footage from the final chapter of the company’s biggest franchise, Harry Potter and the Deathly Hallows  Part 2. We’re not quite sure if what we saw was the early stages for a new trailer or combination of footage both that we’ve seen before and some new stuff. There were a couple of scenes that clearly didn’t have the final visual FX, but as usual, there was a lot of information to absorb in one viewing. The footage shown opens with a close-up of Voldemort, which seems like the best place to start since most of the last movie is about the final confrontation between the Dark Lord and Harry Potter. Voldemort’s voice-over goads Harry by reminding him how many of Harry’s friends and loved ones had died to protect him and it’s time for him to step up. Voldemort tells Harry to meet him in the Forbidden Forest, and once there, Harry encounters many of the people Voldemort referred to, including his parents and Gary Oldman’s Sirius Black. We then see a scene of Harry and Michael Gambon’s Dumbledore walking through an ethereal white expanse (limbo?) to get some last advice from his dead mentor. For the most part, the footage focused on all the action in the last chapter and we see the three main kids riding on the magic cart through the caverns of Gringotts Wizarding Bank with a goblin in order to retrieve another horcrux, but then the cart is blasted and they start falling to the ground, but Hermione calls out a spell that leaves them hovering mere inches from the cave floor. A lot of the footage focuses on a giant white dragon and we see Hermione getting the crazy idea to jump on its back and we see them flying on it until they jump off its back into the lake outside Hogwarts and we see them walking away from it soaking wet. 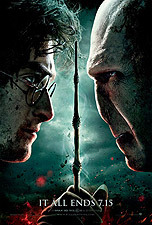 Inside Hogwarts, Harry confronts Snape for daring to stand in Dumbledore’s place after his involvement in the former headmaster’s murder, then we see Snape doing battle with Maggie Smith’s Minerva McGonagall, who then casts a spell to bring a number of armed knight statues to life to help protect the school. The tagline for the extended trailer was “It Ends Where It Started” and we see a scene of the wizards on both sides of the battle racing towards each other in the Forbidden Forest for the final battle, as well as lots of footage of Hogwarts’ destruction and a bridge the group are crossing also being destroyed. Before the presentation, ComingSoon.net had a chance to talk to Davids Heyman and Barron, the producers of the hugely successful fantasy series about how things are going on finishing up the movie including the idea of converting the entire movie to 3D.